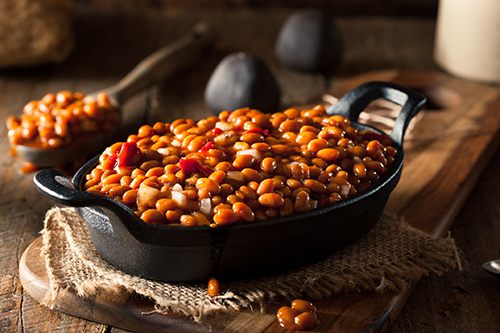 Baked Beans are the perfect side for your cookout or tailgate--especially when you add Dale's! This easy family favorite will have everyone asking for more. (It's one of our family favorites too!) Dale’s Baked Beans pair well with Pull Apart Beef Sliders for any cookout or tailgate! Preheat your oven to 325 degrees. Fry 6 pieces of bacon and reserve drippings. These are one of the most flavorful ingredients! Mix together baked beans, brown sugar, ketchup, barbecue sauce, Dale's Seasoning, onion and bacon drippings. Once mixed thoroughly, pour into a casserole dish. Then, crumble up bacon and stir into mixture. Next, place your casserole dish in oven and bake or approximately 55 minutes. Remove from oven and top with French fried onions. For the last step, broil until onions are brown (approx. 5 minutes).